The Cardiff City Stadium is a familiar setting for Clarets boss Sean Dyche. The 47-year-old former Chesterfield and Millwall defender was in the crowd in South Wales just days before being unveiled as Eddie Howe's successor at Turf Moor. Bluebirds boss Malky Mackay, under whom he worked at Watford. The visitors were well beaten that day as Joe Mason and Craig Noone put the hosts a couple of goals up before the break while Matthew Connolly and Aron Gunnarsson extended the lead late on. As the Clarets sat 14th in the Championship when Dyche was appointed, with 17 points from 13 matches, he said: "The reality was that’s the challenge, we had a feeling of where it was at, what we needed to do and then take it on. "I’d seen them before that, I knew about the side and the build-up to when Eddie left, the results and what was going on. It’s not defined by one game, it’s a pathway." But so much has happened since then. 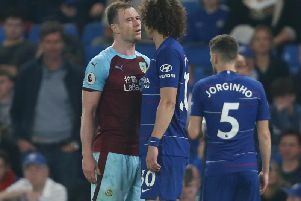 Burnley have been promoted to the Premier League as both runners up and champions and they've finished seventh in the top flight to secure European football for the first time in more than half-a-century. "It’s a strange one," said Dyche. "On the one hand it seems a very, very short time ago, then with all we’ve achieved it seems a long time ago because of what we’ve done. "It’s often the case, seasons go and you wonder where they are, it’s only when you reflect on them to see what's gone on since from that moment." Burnley haven't won in 11 games in Cardiff, there last success was more than 18 years ago when Steve Davis and Andy Payton scored in a 2-1 triumph in Division Two. In fact the Clarets have won just twice in 20 appearances down there. However, Dyche won't be looking too deeply in to those historical statistics. "When I got here this club had about 5-7 clubs we’d had a bad run at. Every club we seemed to play at was like that. "That seems normal in these parts. I don’t think the story is that relevant. I don't know how the club had all these bad runs. Ipswich, Cardiff, Bristol City, Blackburn, Wolves, how many do you want? "If the team perform probably you've got an increased chance to win, that makes mythical situations outside of my timeline irrelevant."